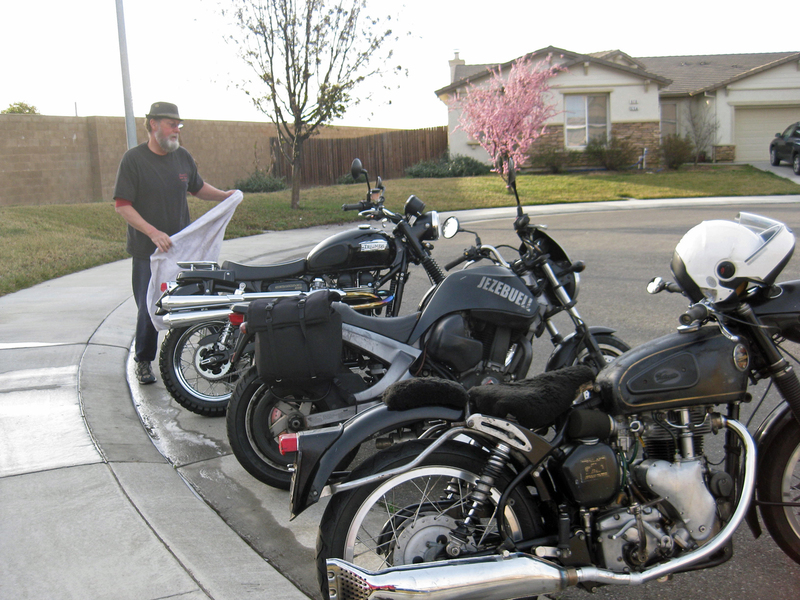 Ron Letcher’s generosity did not include washing our bikes! Notice the pretty exhaust pipe on the Velocette. 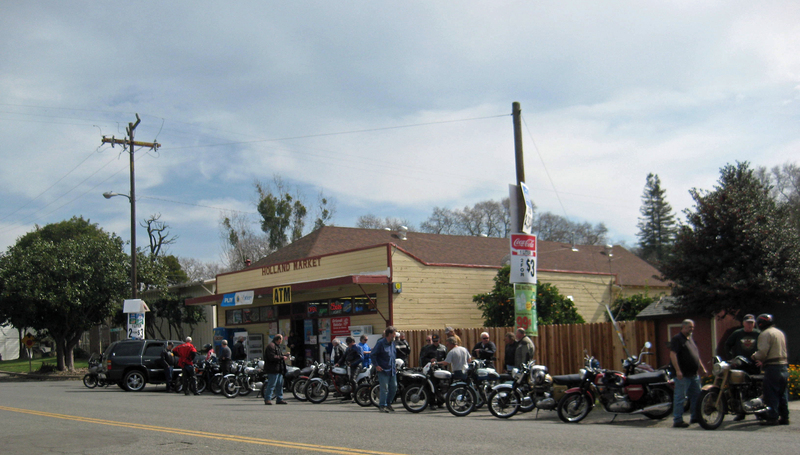 March 2nd was the BSA OCNC Delta Ride, the first organized ride of the year. 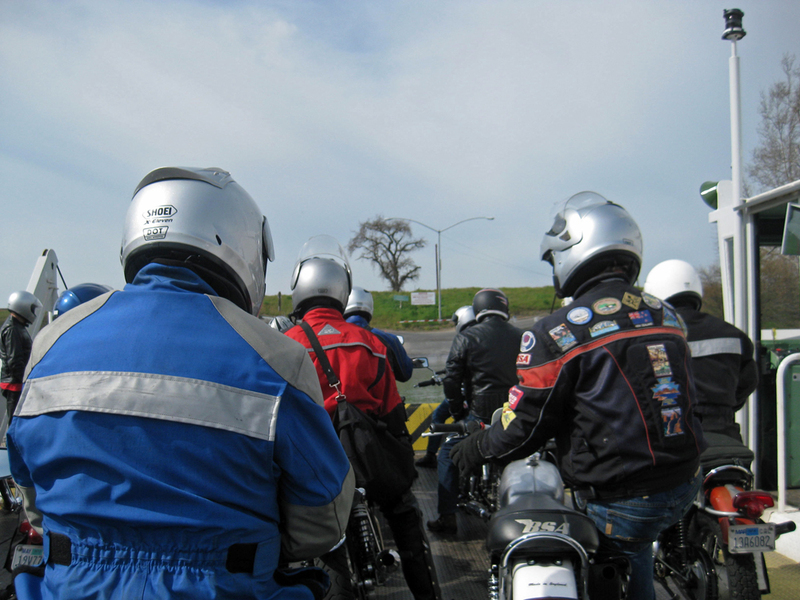 While the ride began in Rio Vista, Jeff and I made the trip longer by first riding from Vallejo to Dixon. 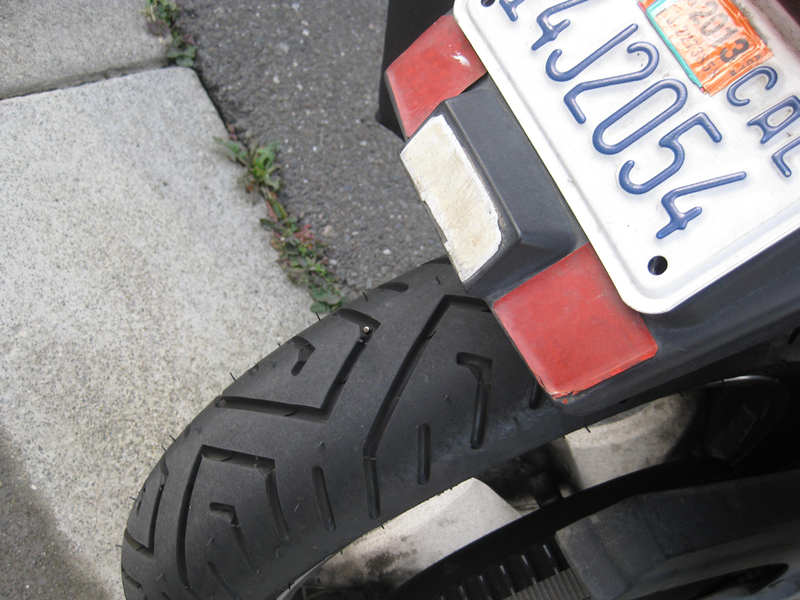 I’m not saying I’ll do anything for a cooked breakfast, but the promise of sausage and eggs at a friend’s home was enough to get me on the road by 7 a.m. Jeff rode his Venom with its new exhaust pipe. I was on my trusty little Buell. Dixon was a out of the way, but this stop couldn’t have been better. After we parked, I spotted something reflecting sunlight off my tire… yes, a dreaded nail was sticking out of my new rear tire. No problem! Ron and Jeff had put a plug in before their coffee was cold. And Jeff took the time to adjust his clutch. Thanks to Rhonda, breakfast was spectacular. We were much more sorted out and ready for the road afterwards. 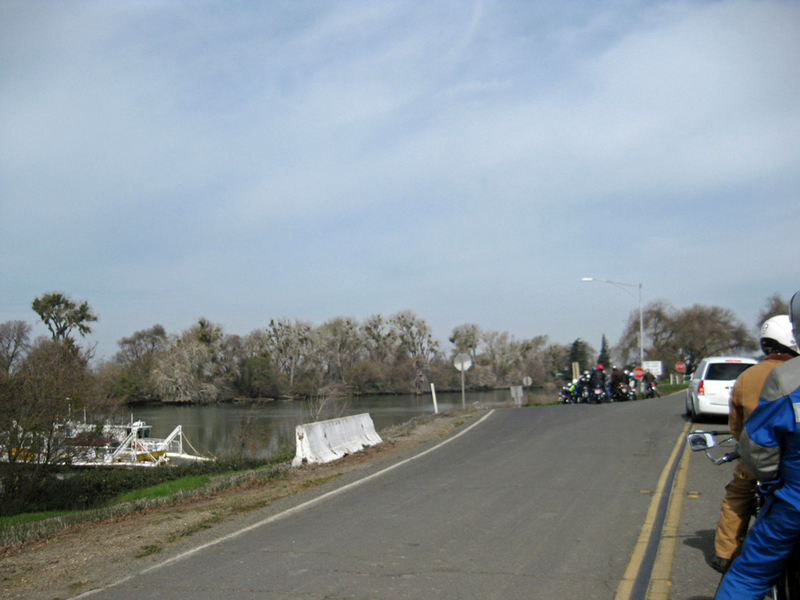 From Dixon we rode south on 113 to Rio Vista. At a parking lot just below the bridge a lot of BSA motorcycles, quite a few other British bikes and the occasional other kind of bike were already gathered. The Venom was the only Velocette, but there were new and old Triumphs, Nortons, and at least one AJS. 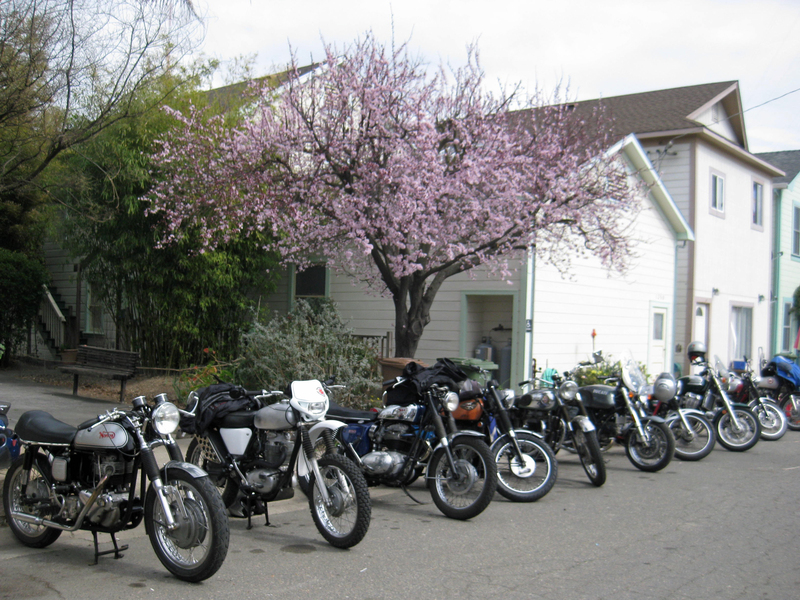 All in all there were between 30 and 35 bikes. 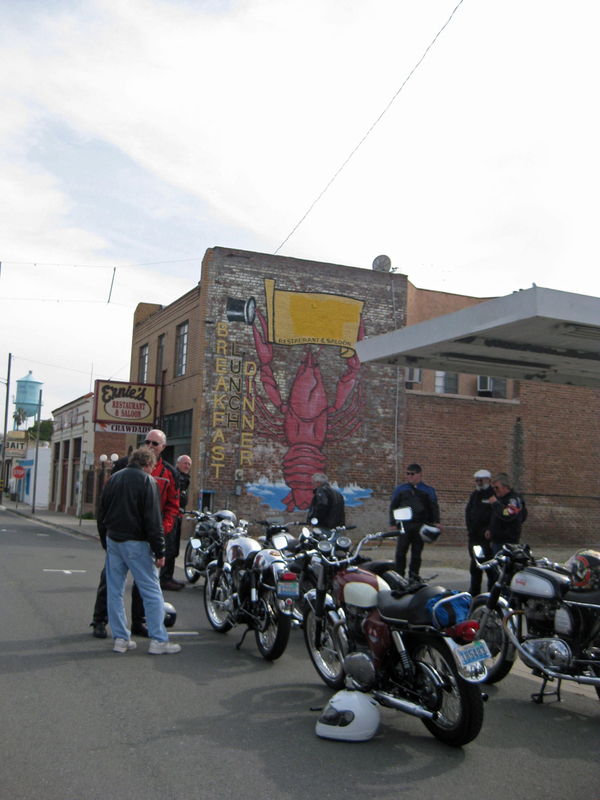 Don Danmeier organized this group of time rebels, distributed maps and went over the route verbally. 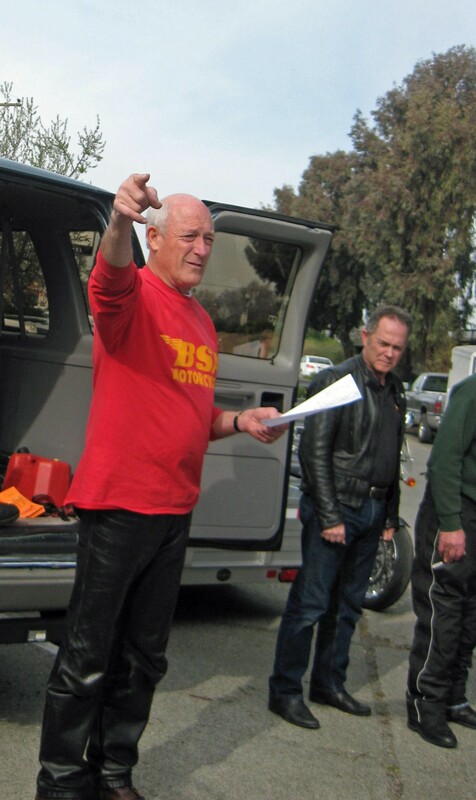 Don telling everyone where to go. Despite all these preparations, the general attitude was for riders to stick together in order to not get lost. That rarely works for me and this time was no exception. Jeff, Ron and I were immediately left behind as Jeff stopped to help Fred start his bike. No worries. We traveled over the bridge and made our own way on strange winding levee roads until we caught up with the group in Isleton, home of the annual Father’s Day CrawDad Festival. From here we traveled over islands, across many bridges, some with steel decks, and on high levee roads that weaved this way and that following the route of river beds. What could be better than traveling on a narrow, one-lane road built up high with water on one side and scenery of fields and farms on the other? One answer is to travel by ferry. We rode north on Poverty Road to Howards Landing Ferry. Amongst this experienced crew, everyone rode on and off the ferry smoothly, efficiently and with awareness of changing road surfaces and each other. Even the conductor seemed to find us interesting. He positioned himself to get the best photos as we came off the ferry. Waiting for the ferry that will take us across the river. The view from the ferry doesn’t include the sensations of being on the water. The other answer is…. Dirt. Yep, the day followed my impression of the early Velo rides. The road kept getting narrower and narrower and finally turned to dirt. Whoo Hoo! Always have to break out of my comfort zone and challenge my riding skills. How else do you know you’re on an adventure? The group gathered in Clarksburg, a beautiful community just a little south of Sacramento but with all the peace of a small town. The library is a great spot! From here we headed back south along the river and stopped in Walnut Grove for lunch. All of these communities have incredible history and hint at how rich and varied California is. After lunch people scattered to get home and make the necessary adjustments to their bikes. There was a promise to enter Mike the Bike’s museum in Dixon and so we escorted Ron back to his hometown. Some how we missed the connections to the museum and so this has become a pleasure deferred. Our ride back to Vallejo looked ominous with black clouds hinting at rain, but we made it home safely, a little tired and looking for the next excuse to explore some of this beautiful state. 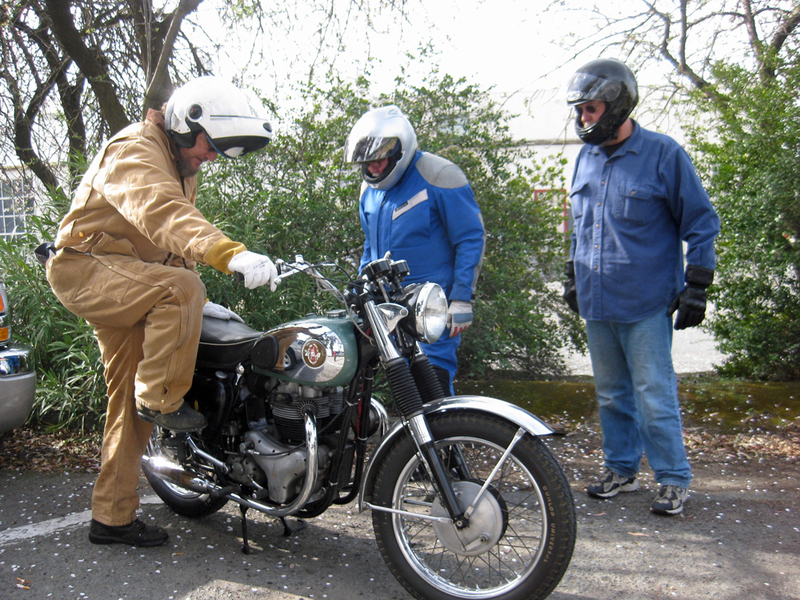 This entry was posted in Velocette & other British Motorcycles and tagged british bikes, bsa motorcycles, rio vista. Bookmark the permalink.